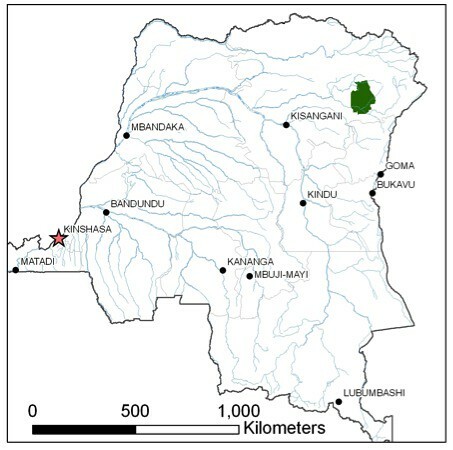 « How Many Bonobos Live in the Forest? where a National Park should be. View from the wrinkled brow of an inselberg. The last decade has been hard on the Okapi Reserve. 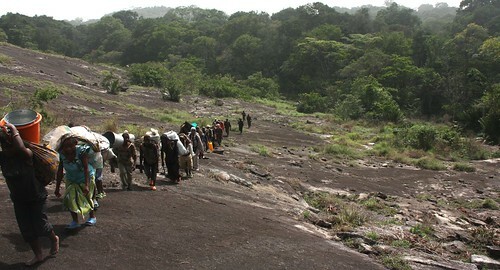 Illegal Miners. Poachers! The elephant population was nearly cut in half during the first years of this century. Even the solitary Okapi was heavily poached. 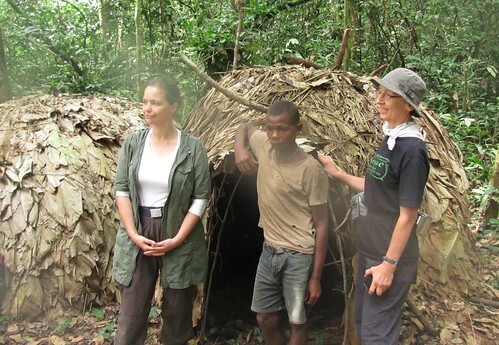 Rosmarie Ruf has been caring for okapis in Epulu since the late-1980s. 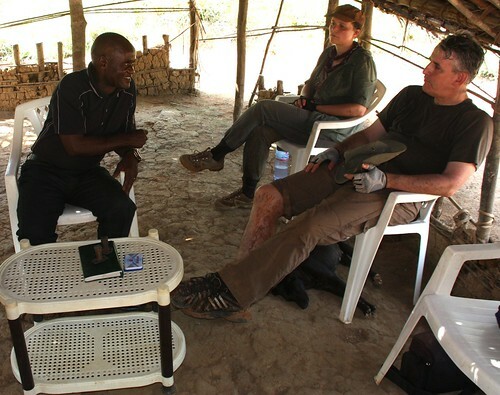 Only a year and a half ago, two guards were shot down when they confronted elephant poachers. And the year before that more guards were similarly lost. 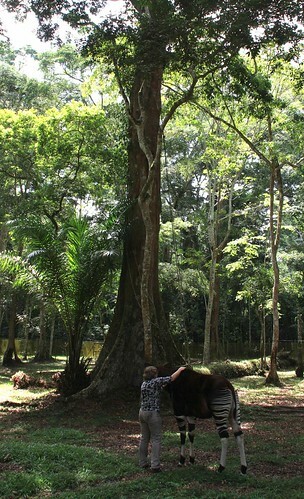 But recently, the Okapi Reserve received new assistance through the German bank. The German ambassador wanted to see what was happening on the ground; therefore, our annual bicycle ride was through the Ituri Forest. The Okapi Reserve, a World Heritage Site in DR Congo’s northeastern Ituri Forest. 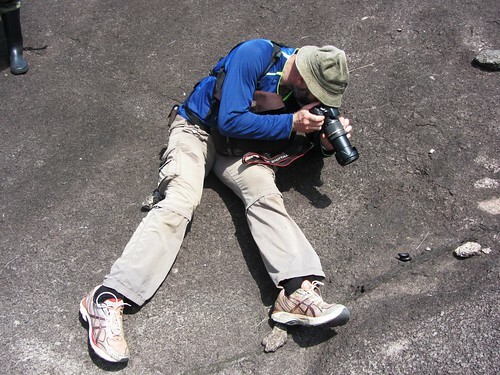 Besides, I wanted to see the strange granite outcrops in the northern Reserve. Despite living in Epulu, the center of the Reserve, for 15 years, I never visited the inselbergs. We bicycled along the eastern limit of the Reserve to an inselberg zone (yellow rectangle). New plant species have been discovered in the inselbergs and these hills have the densest mammal abundance of the whole Reserve. Fifteen years ago the inselbergs with surrounding forest were recommended for an upgrade to national park. Our camp leaders, Ephrem and Gilbert, in front of Encephalartos ituriensis, a cycad species endemic to the Ituri inselbergs. 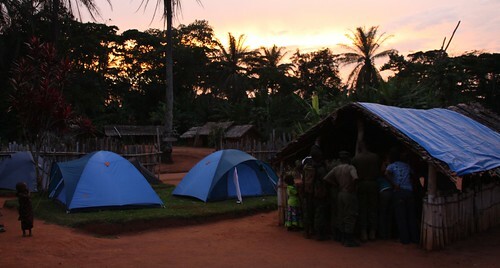 First we shipped the bikes to Kisangani, then we met up in Epulu, 460 km further east. Sounds easy but the condition of the rented van and the state of the road, assured that nothing would be simple. 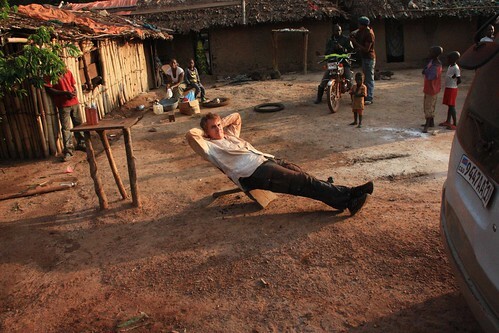 The ambassador waits while the van is being repaired, yet again. Bafwasende: already late, all red with road dust, but the van is fixed. That is worth a toast. 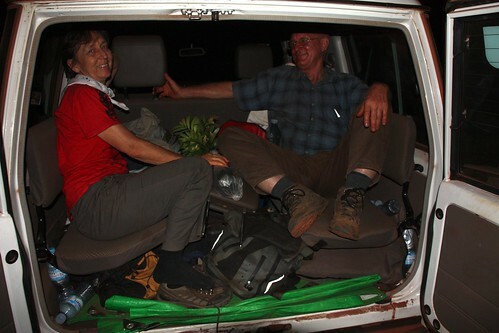 The German project in Epulu loaned us a much better vehicle—thank you! We drove on to Mambasa in relative comfort. Relative comfort in the German-aid (GFA) van, I actually slept a good part of the way. More photos of road trip here. We gathered up the rest of the team at the Catholic Mission in Mambasa. 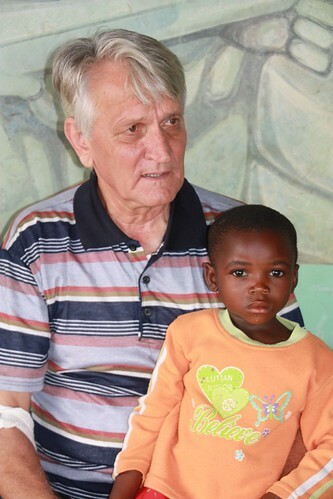 Père Sylvano of the Catholic Mission in Mambasa has a wonderful, long story. It will be another post. Here he is with one of the many orphaned children he cares for. The next day we pedaled. 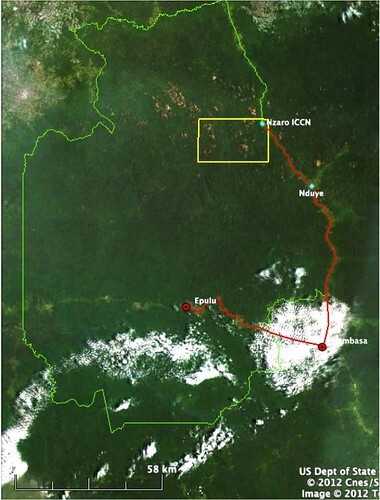 The first stretch north is occasionally travelled by 4-wheel vehicles as far as the satellite mission, Nduye, maintained by Père Sylvano. We easily passed the other bicyclists -or tolekistes – that were on the road and the main transport vehicles. 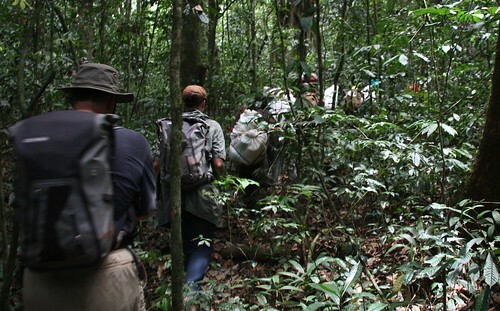 We climbed along the east side of the Reserve, through the lands first of the Lese Karo and then of the Lese Dese. Chef Sukari, chief of the Lese-Dese, held court with ambassador Peter and his wife, Sabine. 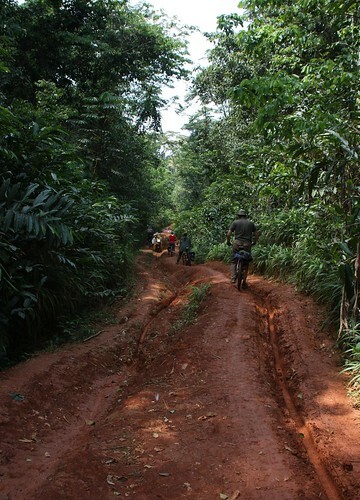 Beyond Nduye there was no longer even the possibility of a four-wheel vehicle. 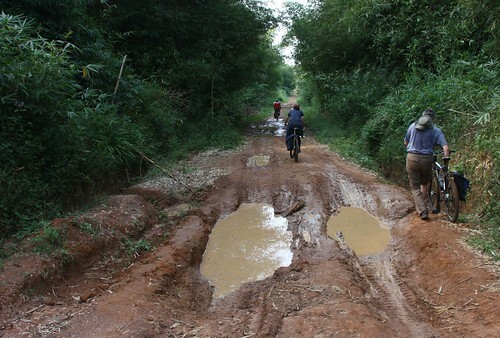 The only tracks were bicycle tracks, and the red clay was often treacherously slick. Rest stop after a long uphill. More photos of the bicycle trip here. The next day the hike began. We walked west into the inselbergs. Including porters, we became a caravan. 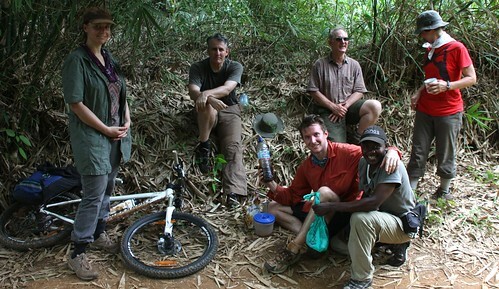 Chef Sukari had recommended the Efe, Antoine, as our guide. The local Efe hunter, Antoine, led our caravan to his farthest camp where he poses with Sabine and me. The Efe, however, are archers not net hunters like the Mbuti Pygmies in Epulu. 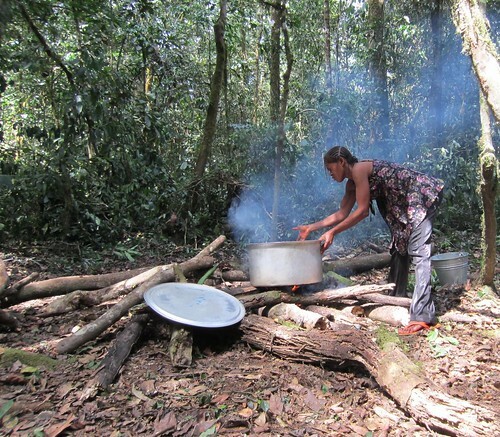 The Efe do not roam far to hunt and the second night Antoine said that we were now at his farthest honey camp. He did not know the “vilima” or inselbergs further west. In fact we saw no human sign farther west. Lucy had to cook for a lot of people. 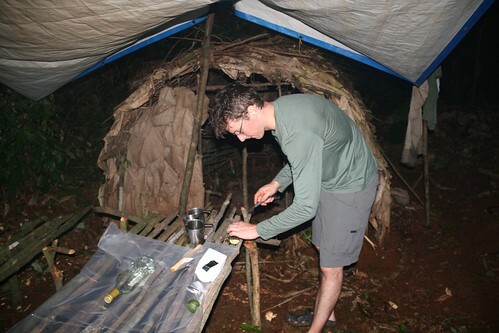 Jesse cutting a precious lemon in “Camp Antoine” for the carefully rationed pre-dinner drinks. Antoine and a Park Guard ponder “Google Earth” from a distance. John had brought his computer. 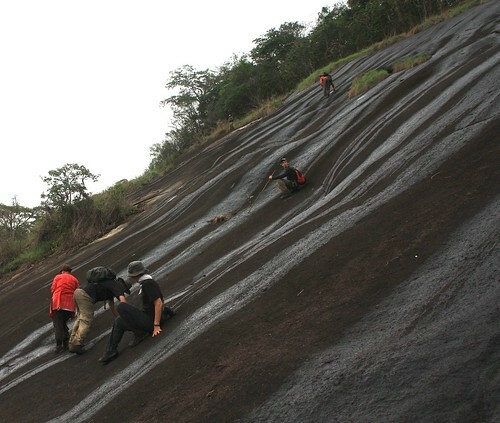 With a combination of google earth, GPS and compass we found our way to the inselberg we later named Kilima Mtu, or Person Mountain. A stone guardian monitors the forest below. It had four boulder sentries on top looking out over the forest in four different directions. There was something at once mysterious and almost magical about all the inselbergs… and this last one in particular. 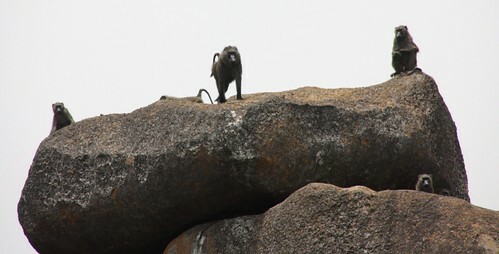 The baboons were more curious than fearful. We found a pottery shard on an altar-like stone in one rock shelter. How old was it? Who had left it? On the very top of Kilima Mutu, there were springs welling up from beneath rocks; in the valleys of its inselberg arms there were little grassy patches trampled by elephants and there was okapi dung in the shade of its amazingly rugged trees. 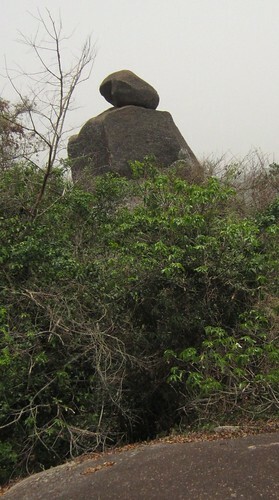 And the “watu” , or stone people, at the top, watch over the forests in all directions. May they keep this place safe and may it soon become a national park. 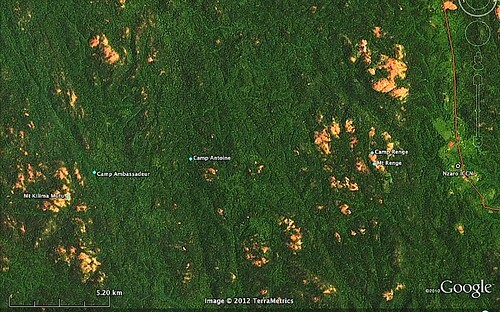 A Google Earth close-up of the forest we walked to get to Kilima Mutu. More photos of the inselbergs and hike to get there are here. About the Okapi Reserve: It became a World Heritage Site in 1996 and, a year later, was given global “threatened” status with the outbreak of civil war. It is still on the list of World Heritage Sites in Danger. 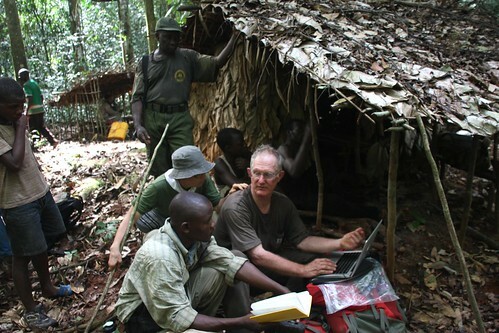 Its renown is not only the forest giraffe, or okapi, but also the large populations of still forest-dependent Efe and Mbuti pygmies. 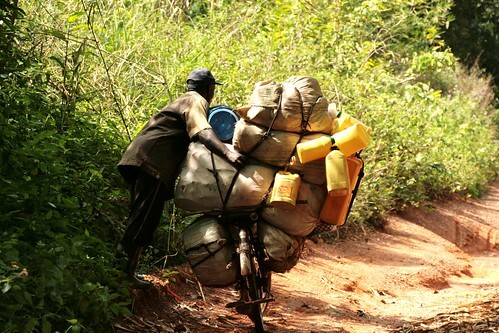 If the forest becomes impoverished, their way of life is imperiled. When first nominated to the World Heritage List, it was assumed the Okapi Reserve would soon become a National Park. 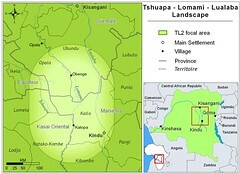 The war is over, but not the rush to grab Congo’s resources. 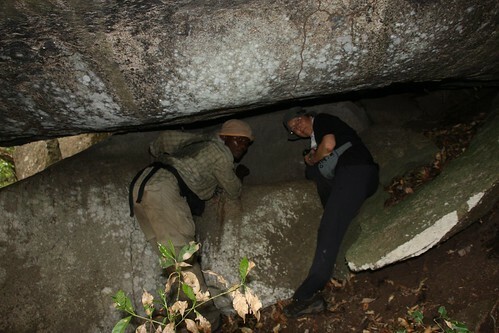 The Conservation partners of the Okapi Reserve (ICCN, WCS, GIC, and GFA) have suggested an inner sanctum that would include the inselbergs. This now needs national legal status, a lobby from all levels to make it a national park. Credits go to the whole bike ‘n hike team including the German Ambassador and his wife, Peter and Sabine Blomeyer, their friend from Germany, Frank Oberlaender (particular thanks for his great portraits and other photos), a young bike and drum buff from the USA, Jesse Brooke. There were John and I from the Lomami National Park (soon-to-be Park, anyway) and Joel Masselink, a map expert from the Okapi Reserve. 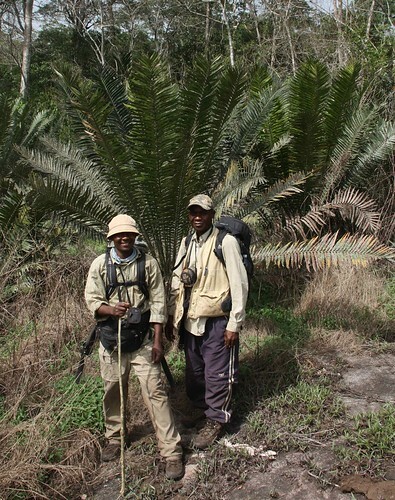 Key were our guides, team leader and tracker from the TL2, Ephrem Mpaka and Gilbert Paluku. Logistician: Robert Abani. And of course the cooks, Lucy and Mbinza Sira. Frank zeroing in on a millipede. This entry was written by Terese Hart, posted on 2012-04-25 at 11:05 pm, filed under Elephant, Indigenous peoples, Okapi. Bookmark the permalink. Follow any comments here with the RSS feed for this post. Post a comment or leave a trackback: Trackback URL. What an adventure! Thanks for taking us along. 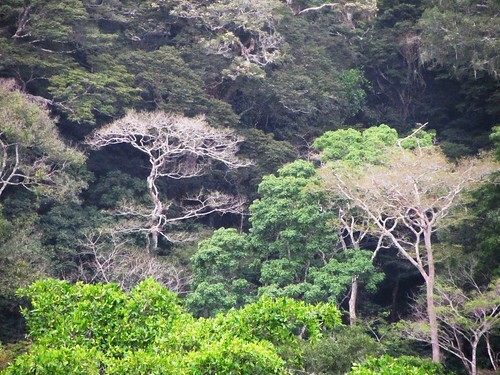 Great to know there are still unexplored places like that in the Okapi Reserve. What a wonderful trip! Thanks for sharing your adventure. Fascinating place. Good to see Father Sylvano still kicking! I am so wrecked at just the IDEA (from our point of view) of the bushmeat trade. It would most likely be different to me if there wasn’t such an insane priority towards mammals that resemble humans. Chimpanzee hands? Bonobo hands? Gorilla hands? FACES? (To me, the resemblance to cannibalism deeply hurts me,I’m not (how can it be put in words? )any kind of racist or fascist,why must I feel like I am making stupid judgements of a society I have no understanding or empathy towards? I suppose that in a developing consumer society, where nothing like this newfound young affluence has ever been seen, the desire to treat your inlaws or prospective business partner to the best of your ability must be frightening in your lack of experience of this thing. Whoever it was who made the jump from extremely poor logging worker to the P.T. Barnum of the instantly overexploited small animal trade must now have a big fat wife, and many sons to carry on his depradations far into our future. Too bad that there is a limit to the area where the logging roads can be built. I quit.